September 19, 2018: A revised version of “A Summary of Your Rights Under the Fair Credit Reporting Act” dispute form was released on September 12, 2018 by the Consumer Financial Protection Bureau (CFPB) and all employers and background check companies have one week to comply. MBI Worldwide has integrated this new Summary of Rights form into our online applicant portal paperwork. 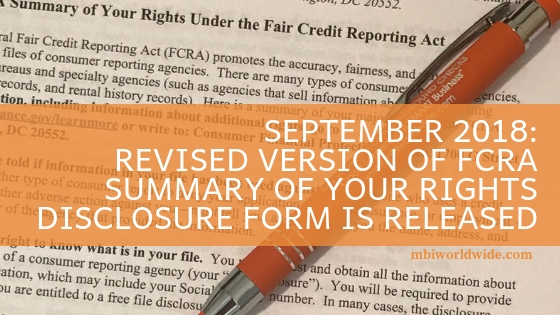 If you give candidates a hard copy of “A SUMMARY OF YOUR RIGHTS UNDER THE FAIR CREDIT REPORTING ACT” dispute form, it is required that you use the new form effective September 21, 2018. Congress passed the Economic Growth, Regulatory Relief, and Consumer Protection Act in May 2018. This was in response to several high-profile data breaches. This new law passed by congress, requires credit reporting agencies (under specific circumstances) provide the consumer with fraud alerts and national security freezes (and freeze releases). These changes are intended to make is more difficult for identity theft. Additionally, the new legislation amends the FCRA to exclude from consumer reporting information certain medial debts incurred by veterans. It also enacts a new dispute process, which is in connection with any said medical debt. This newly passed law also requires that when employers and/or background check companies are required to provide a copy of the “Summary of Rights Under the Fair Credit Reporting Act” or the “Summary of Consumer Identity Theft Rights” forms, they must also provide a new notice concerning these new rights. In order to remain compliant in your employment background screening practices, employers and background check companies MUST update their forms and begin using this revised version of “A Summary of Your Rights Under the Fair Credit Reporting Act” dispute form prior to September 21, 2018. 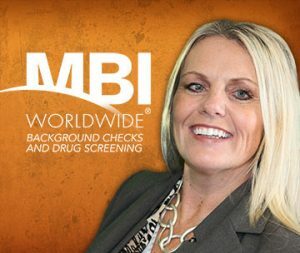 Kandi Chapman is President and Founder of MBI Worldwide Background Checks, a NAPBS accredited, HRO Today Baker’s Dozen, global employment background screening company. She writes articles related to employee background screening, as well as entrepreneurship, human resources and company culture. To request Kandi as a speaker, contact her through MBI Worldwide at info@mbiworldwide.com.